I am frequently asked about marketing to cell phone users. First let’s cover some earlier points I have made about why marketing to cell users is important. A 2011 National Health Interview survey (NHIS) indicates that the number of American homes with only wireless telephones is growing. More households (more than 3 in 10 homes) in the US now have only cell telephones. This 31.6% share is an increase of 1.9 percentage points over the second half of 2010. So what can we draw from this?? In the coming years landlines will be a declining factor in our marketing strategy. Cell phones are not listed in phonebooks, meaning cell phone users have little or no use for one. Where are people using cell phones? But this trend has greater ramifications than just the death of the phonebook. Phones are no longer just for verbal point to point communications. 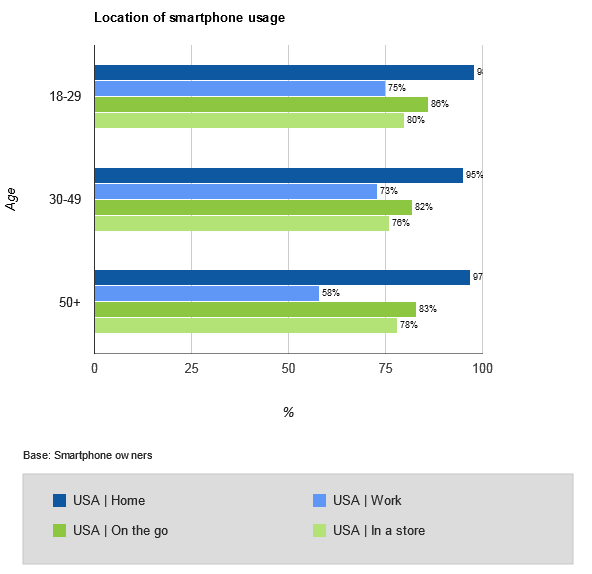 People are using smartphones gather information, find reviews, find nearby services, and buy. So what about Mobile marketing and SEO? From and SEO standpoint, rank and relevancy are the same whether serving a mobile or desktop device. Your content and how people vote on your content (with incoming links), are still at the core of getting you to first page of the results. I view bifurcating your efforts with separate mobile and desktop websites as one that dilutes any work you are doing to promote your web presence (and one that ignores tablet devices). From a marketing standpoint, we can run a separate mobile targeted campaign and, typically these do very well, costing less per click than desktop campaigns. And while this is easy to do, you need to consider that it’s not enough to market to a mobile device, you need to take the prospect to an appropriately formatted landing page. The data I have seen suggests that tablets (also classed as mobile devices by Google) are also having serious impact on business. We are seeing that while people are often researching on phones, they are often making purchases on tablets. Carrying this a step further, remember that not only are mobile, tablet and desktop screens different sizes, but mobile devices can easily change orientation from portrait to landscape. Consider the age group of your target audience and mobile in your marketing efforts. Keep in mind that these groups are aging up, and shift your marketing dollars away from print ads toward online advertising. If you’re serious about mobile, you should consider updating your website to a “responsive” design that can dynamically reformat its display to accommodate desktop, tablet, and phone users.